Would you like to build comprehensive pearl knowledge, or dive into the pearl varieties that interest you? Would you like to know as much (and sometimes more) as a jeweler or salesperson? 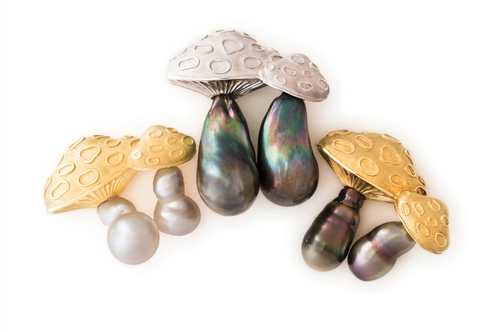 The Cultured Pearl Association of American has just launched a new e-course, "Pearls as One". Pearl guru Jeremy Shepherd of Pearl Paradise was a key developer, and he's offering a coupon code reduces the $600 price to... free! The code, PEARL10951PARADISE, is valid for a limited time, so hop to it and register. Designed for jewelers and retailers, the course contains ten modules, but if you want to learn about only Tahitians, for example, you can select only that part. Or, take the entire course and exam, and become a Certified Pearl Specialist! And pearl hug to reader Cynthia Newberry for telling me about the coupon! I know you dropped by to peer in the window, and the Passage today greets autumn with a trio of whimsical pearl mushroom brooches. These are by Elizabeth Blair Fine Pearls. I met Ms. Blair Kirby recently, and will tell you all about her magical shop soon. Enrolled! thanks so much for the code! Those mushroom brooches are beautiful...and so clever. Can't wait to see more of her work. And thanks for sharing the course code. Thank you for sharing this course code! I adore pearls and it looks extremely comprehensive. I have followed your blog for some time now and have to say, when you offer a coupon to your readers it is the best! Thank you, I can't believe I found this! I stumbled upon your site while googling a DVF gold necklace clasp I had seen at auction & have I've just read all your pearl pages. I live in the UK and have been looking for a course like this for a long time. I'm a small-time collector & designer (jewellery, but not yet pearls about which I know little). Autumn & winter evenings are going to be busy this year.